Public Art Saint Paul and Works Progress are developing a pilot series of workshops to respond to and equip public artists and their current and potential collaborators, providing cross-disciplinary education, professional development, and networking opportunities for collaborative public art-making. This first workshop introduces Saint Paul's Public Art Ordinance and opens a space for talking across professional silos about how to make the most of this legislation through future workshops and programs. Find more details below and register here! Room number will be shared with registered participants. Beverages and light snacks provided, please bring a brown bag lunch if desired. 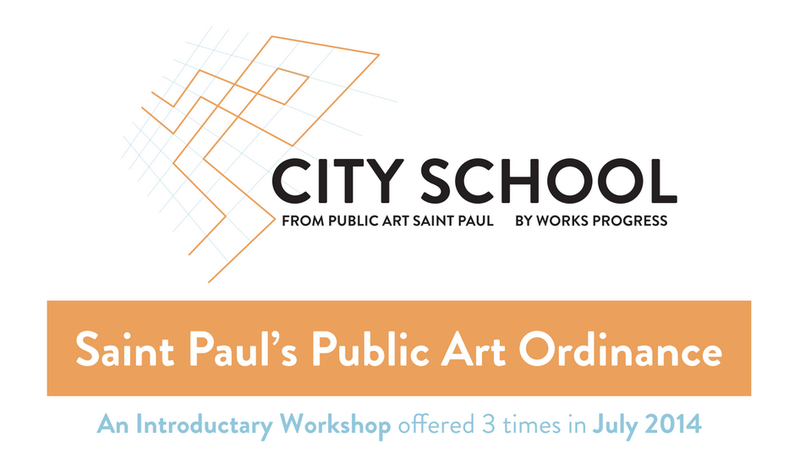 This half day-long workshop will introduce Saint Paul's Public Art Ordinance. Passed in 2009, this legislation establishes that artists should be involved from the earliest stages of City projects through design and implementation. What does this mean for City employees, contractors, community developers and public artists? Participants from these professional communities will gain insight into ways this Public Art Ordinance is enacted, and will shed light on areas where further education, engagement and professional development work is needed. In the process, participants will also build new connections and a shared vocabulary across disciplines, practicing collaboration through fun workshop activities. REGISTER NOW FOR THE FIRST CITY SCHOOL WORKSHOP. CITY SCHOOL is Public Art Saint Paul's new education program for city making professionals. As a foundational component of Public Art Saint Paul's Next Public Art initiative, CITY SCHOOL provides artists and their current and prospective collaborators with opportunities for education, professional development and networking. All CITY SCHOOL programs are designed to be eligible for continuing education credit from a cross-section of professional associations.